I am super excited about this one. For one, my loveley bride is on the bill. She also sings harmonies all over their new album. 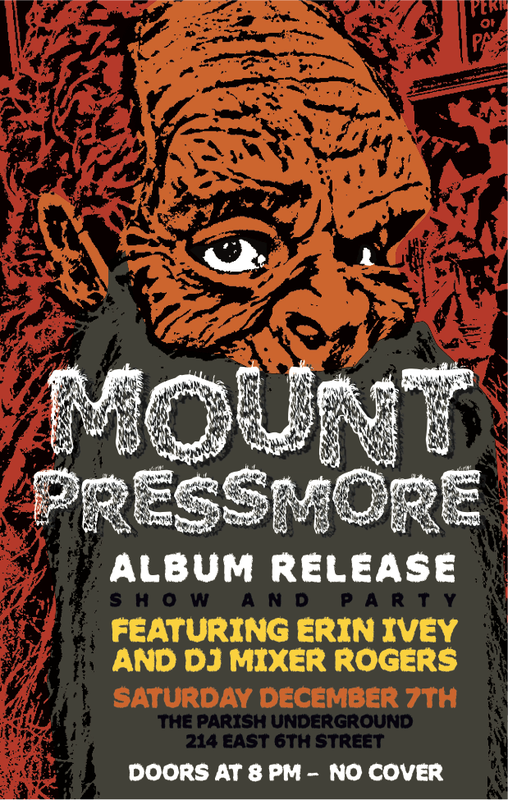 That is, Mount Pressmore’s new album. They are so great. I’ve been listening to their new album Enjoy on repeat for the past couple weeks. It’s hard to say exactly what type of music they make. It runs the gamete. I hear a little Peter Gabriel, Elbow, Fela Kuti, Talking Heads, Steely Dan…just to name a few. This is their Album Release Party and there is no cover charge. I will kick things off at 8pm, Erin Ivey goes on at 9pm. Then Mount Pressmore at 10pm. Then I will take the reins again and keep the party going until they tell me to stop. It’s going to be a great night of music. This entry was posted in Shows and tagged 6th street, ATX, Austin, Cam, CD Release, DJ, erin ivey, live music, Love, Mixer, Mixer Rogers, mount pressmore, parish, Party, Rogers, Show, Texas, underground. Bookmark the permalink.